One of my very first meditation teachers asked a group of us to consider that within each of us was a never ending fountain of joy that we could tap into. While that sounded great, for me it was a far stretch from what my daily life felt like. In those days I had a lot of anxiety, doubt, and fear that occupied my mind and body. It seemed absurd that somewhere underneath my troubled mental and emotional states that there could be something other than what I was going through. So I put this piece of information into the back of my mind and just kept on meditating. I meditated every day for 30 minutes to an hour and although I wasn’t connecting with this so-called ‘fountain of joy’ inside me, I was experiencing deepening levels of inner peace and calm. Then, one day after I had finished my morning meditation and I was sitting there relaxing into the peaceful state that had come over me during meditation I noticed something else was going on. All of a sudden I felt like every cell of my body was filled with happiness and joy. The best way I can describe it is that it felt like tiny bubbles of joy were flowing from deep down inside me and were constantly bursting inside the cells of my body. This was such a beautiful experience and I didn’t want to move just in case it stopped. So I sat there for ages rejoicing in what was going on inside me. I have no idea why this happened, or even how it happened, but for whatever reason, I had been shown that there really is a fountain of joy inside us and all it needs is to be allowed. This beautiful radiant joy lasted for hours and even as it started to fade into the background, there was still an under current of lightness pulsing through my body. It is experiences like these that have helped me to accept that there is so much more to life than meets the eye. I’m the kind of person that used to need proof before I’d believe something that I hadn’t experienced for myself. These days, I’m a lot more trusting of the unknown and am willing to dance in the mystery of life, rather than try to control it all the time. Do I believe that we all have a fountain of joy inside us? Absolutely. Will everyone get to experience it for themselves? Well, that’s really up to the individual and if you are willing to explore the possibility that it exists for you. 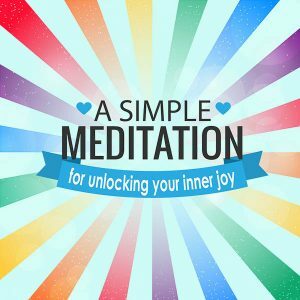 Here’s a really simple meditation technique to instantly start allowing more joy in your life. 1. Find a comfortable place to sit or lie down. 2. Close your eyes and take 3 slow, deep breaths into your lower belly. 3. Let your breathing return to it’s natural rhythm. 4. Now visualize or imagine that you have a big smiley face sitting in your belly. When we have a fully belly laugh that’s when joy happens naturally for us as it takes over your entire body. That’s why it’s a very powerful part of the body to focus on cultivating joy. 5. Continue to focus on having a big smiley face in your belly. If your mind wanders just gently bring your attention back to seeing or feeling a big smiley face in your belly. Do this for at least 5 to 10 minutes. 6. Let go of doing anything and just allow yourself to relax and let go completely for a minute or two. If you find it hard to see or feel a smiley face in your belly then remember a time when you did have a really good belly laugh and see if you can allow that feeling to wash over you again until you feel it in your belly. It’s also perfectly okay if you find that you start laughing during this meditation. Then, just make laughter your meditation practice for the session.